Assalamualaikum and Peace be upon all of you. Royal segment today will cover the Perakian Royal Family. We already cover 7 royal families and only 2 to go. The Perak Royal Family among the oldest in Malaysia. The family is descendant to the last Sultan of Malacca. 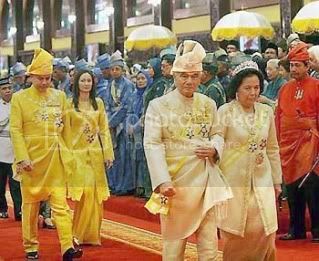 Unofficially, the Perak Royal Family is the symbol to Malay beauties as many of the member of the royal family are undeniably handsome and beautiful. The ruler of Perak is style as HRH Sultan of Perak. 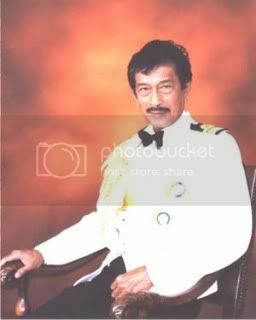 The 34th Sultan of Perak was HRH Sultan Azlan Muhibbudin Shah Ibni Almarhum Sultan Yusuf Izzuddin Shah Ghafarullah. He ascended the throne of Perak in 1984 and celebrate his Silver Jubilee of his reign in 2009. He died on 28 April 2014 after ruling the State for a glorious 30 years. The consort to the Sultan of Perak is styled according to her bloodline. Consort of royal blood is styled as Raja Perempuan of Perak (literally Queen regnant of Perak), while commoner consort is styled as Raja Permaisuri of Perak (literally Queen consort of Perak). 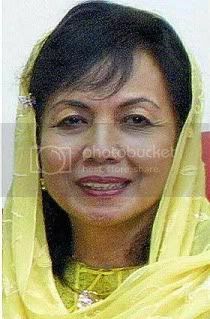 The current consort to Sultan Azlan is styled as HRH Raja Permaisuri of Perak, Tuanku Bainun binti Mohd Ali. After the death of Sultan Azlan Muhibbuddin Shah, his first son, Raja Dr. Nazrin Shah was proclaimed as the 35th Sultan of Perak and styled as Sultan Nazrin Muizzuddin Shah. The history of the state of Perak (Negeri Perak Dar ur-Ridzwan) begins in 1528 with the installation of Sultan Muzaffar Shah I, a descendent of Sultan Mahmud Shah of Malacca. The dynasty is thus directly descended from the old ruling house of Malacca. The lucky start to the dynasty's history did not last long as the the country was soon prey to competing Empires, Aceh, Bugis, Portuguese, Dutch, Siamese and eventually British. On two occasions, the Sultan and Royal family were carried off to Aceh, in Sumatra. The discovery of the richest tin deposits in the world in 1824 drew in a huge influx of immigrants, particularly Chinese. Coupled with complicated rules of succession to the Sultanate and powerful territorial nobles, a degree of social and political turmoil was inevitable. British intervention in 1874 brought about a semblance of compromise, when the then ruling Sultan (a usurpur) was induced to abdicate in favour of the rightful heir, in return for a pension. A British Resident came to advise the Sultan and an Indian recruited military police force was established. However, the new Resident did not prove popular and was assassinated in 1875. Unfortunately, the newly installed Sultan had been implicated in the affair, so found himself deposed and exiled to the Seychelles. A regent was appointed in his stead, and eventually allowed to become Sultan, ten years later. He died within a month of his new sovereign status. His successor, Sultan Idris, proved to be one of the wisest and forward thinking Malays of his generation. The state greatly prospered and developed under his benign rule, finances were brought under control, and the first steps towards federation taken. Perak was one of the first states to form the Federated Malay States in 1897. However, the state suffered a great deal from the slump in rubber prices, following the end of Great War. Although Idris died in 1916, his successors proved to be equally advanced in their views. Sultan Alang Iskandar Shah, had served in the FMS police and took a leading part in the establishment of the Royal Malay Regiment in the 1930s. Perak was invaded and conquered by the Japanese on New Year's Day 1942. Fortunately perhaps, Sultan Abdulazziz, was not one of the rulers deposed by them. Sultan Azlan Shah married with Tuanku Bainun and their married is blessed with 5 children, two Princes and three Princesses. 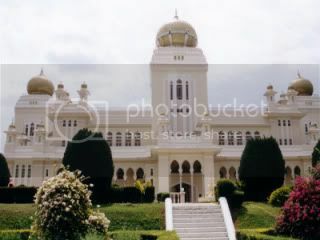 The official Palace to the Sultan of Peark is Istana Iskandariah (Iskandariah Palace) located at Royal City Kuala Kangsar, Perak. Some correction if you may...H.H. Raja Datuk Sri Nazrin Shah bin Sultan 'Azlan Shah was appointed as Heir Apparent with the title of Tuanku Raja Muda, Wakil us-Sultan, Wazir ul-Azam on 15th April 1987, on the death of H.H. Raja Muda Datuk Sri Raja Ahmad Shiff ud-din ibni al-Marhum Sultan Sir Iskandar Shah al-Kaddasu'llah..
Sultan Azlan Shah in his 21. So Handsome. Would like to know why was the late Raja Baharom never appointed to be in line to the Perak throne? Very good job and very informative website. It would be better if some correction be made to some english grammatical errors. Otherwise I had an interesting read. Thank you!